Congratulations to all of our Advanced Programs students on the culmination of their Fall 2017 Residencies and Internships. At a special holiday listening party, students shared tracks from their digital music production residency with Young Producers Group and the guest program Beats By Girlz. A special thanks to Ableton, not only for their generous support of hardware and software to the program, but for providing special gifts for every student. 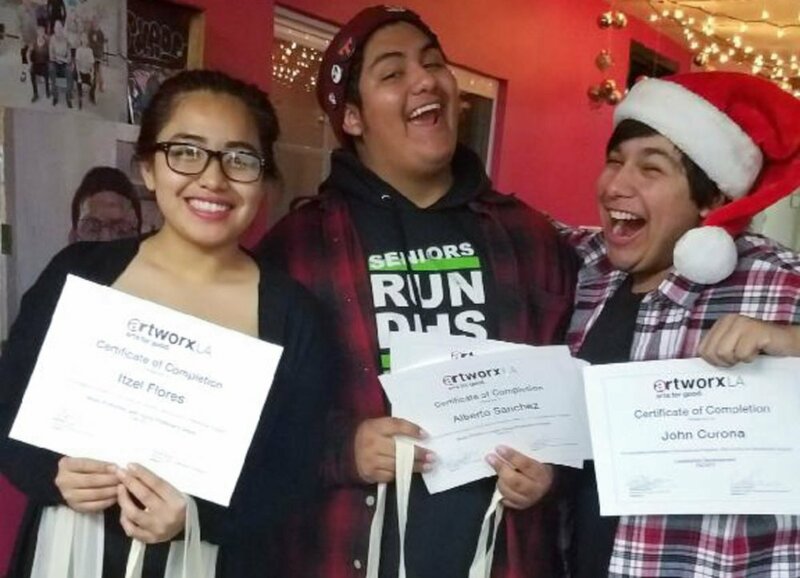 artworxLA High School Interns hosted the event as part of their work in leadership development, life skills, and career readiness programming. Through journey maps and vision boards for their future, students presented on their ten-week experience led by Teaching Artist Sol Alvarez. Students learned how to communicate their stories, how to prepare for school and job applications, financial literacy, and more. Thank you to everyone who came to celebrate the holidays and support our students!